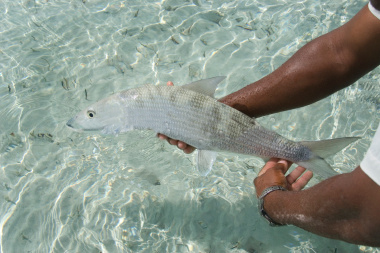 The Bonefish, scientific name Albula Vulpes, is one of the most popular sport fish in the world. They aren’t much for eating because their bodies are full of hundreds of tiny bones as indicated by their name. They are often called silver ghosts or phantoms because of their silvery skin color. They can be as long as 3.5’ in length and weigh up to 22 lbs., although most are about a third of that size. Bonefish are long and slender with cone-shaped snouts. They are blue/green on top with silver scales along the bottom, and have long, dark stripes running along their body. They like to live in warm subtropical waters around reefs or bays, and can be found in the Western Atlantic, ranging from North Carolina, down to the Gulf of Mexico, and around to Brazil. They also range in the Eastern Pacific from California to Peru. They spawn in the deeper parts of these waters where the eggs can be more widely dispersed. Spawning occurs year round, but there is less activity during the summer months. 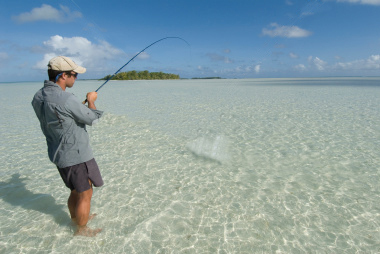 The key to catching Bonefish is to make the lure act just like the shrimp or krill that the fish feed on. A fisherman could use live shrimp or crab for bait, but most rely on flies and artificial lures. Most Bonefish are caught between the depths of 6 inches and 10 feet. They can be most easily caught on flies, plugs, soft plastics or live baits during flat tidal periods. Bonefish have the ability to adapt to water with low oxygen content. They have a small air bladder that functions similarly to the human lung. As the fish inhales, the bladder goes to work supplementing oxygen for the fish to use. This gives the Bonefish a little more versatility for habitats and hunting grounds because it can live in waters aren’t suitable for other species to live in. Bonefish spend their time in shallow waters rummaging through the sand in a process known as tailing. As they swim, their tail fins show on the surface of the water, and are visible from above. This process is quite contrary to their deep water tendencies when the fish stir up the silt on the ocean floor. This is known as mudding because it makes the water murky and opaque. Whether they are revealing themselves on the water’s surface or hiding within its muddy depths, the Bonefish is still one of the most significant game fish out there. They may not be the most delicious fish in the ocean, but they are good contenders for being the most fun. Their swift moves facilitated by the shape of their body make them challenging to catch, while their water-like colors make these “phantoms” hard to spot. They have certainly made an impact on the sport fishing community.